iquor control has been a prominent issue in Oregon politics since well before statehood. Most early laws relating to liquor control were intended to prevent Native Americans from obtaining and possessing liquor. 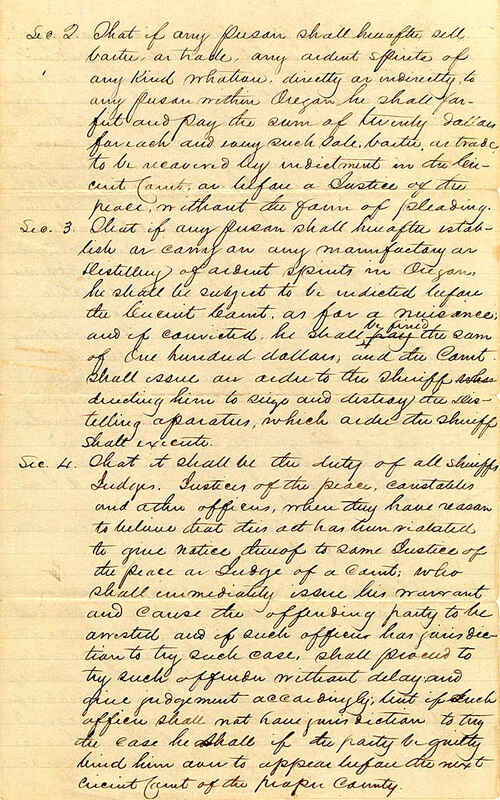 In June of 1844, Oregon's provisional government enacted a prohibition law designed to "prevent the introduction, sale and distillation of ardent spirits in Oregon." 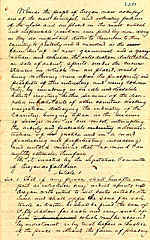 (page 1 of act ... page 2 ... page 3) This law remained in effect until September of 1849, when the territorial legislature repealed it. Rather than total prohibition, Oregon passed various laws in the following decades designed to regulate liquor sales. These acts tended to specify certain licensing criteria for the selling of liquor, and in some cases banned the sale of alcohol in areas near construction projects and churches, or to minors and the intoxicated. The last decades of the 1800s saw the temperance movement gain increasing attention in the United States. 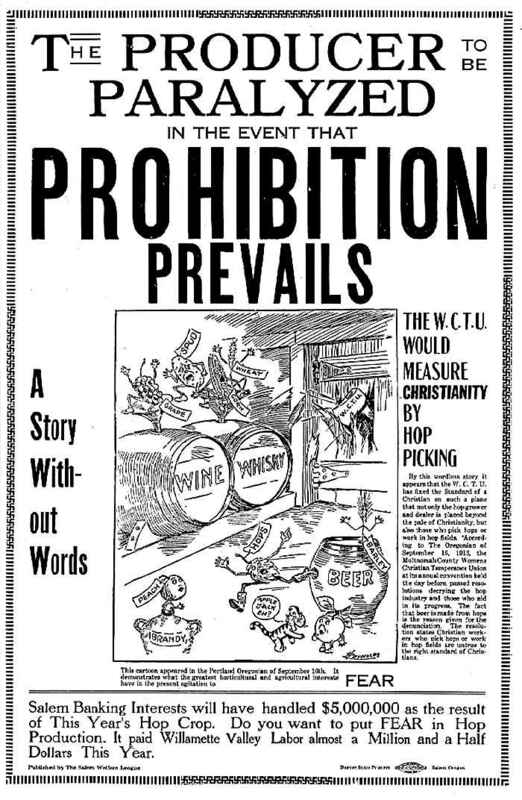 Led by the Women's Christian Temperance Union (or WCTU) and the Anti-Saloon League, public displays against establishments that sold liquor (particularly saloons) became commonplace in many cities and towns throughout the nation. The fame of such figures as the hatchet-wielding Carrie Nation, who would enter saloons and smash liquor containers and other paraphernalia, brought the temperance movement to the attention of the nation, including the citizens of Oregon. For some time, the temperance movement was joined by the equal suffrage movement in an attempt to enact both as needed social reforms. 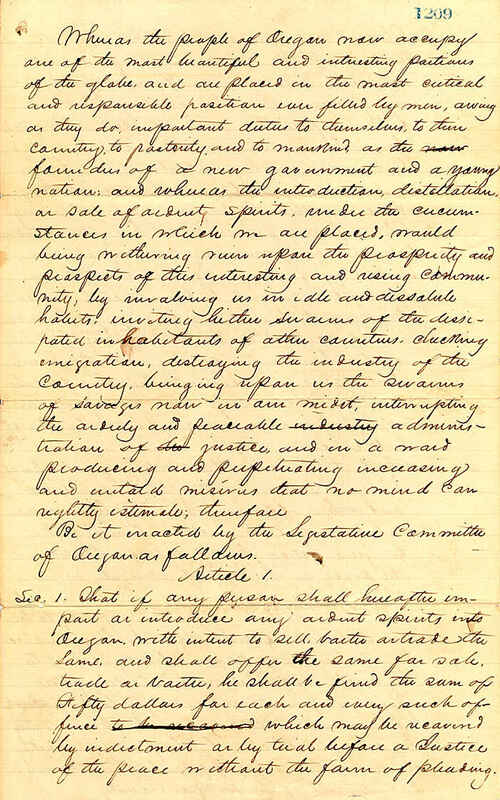 However, the two movements were unable to divide their focus between the two issues, and each tended to view the other as inhibiting their adoption both in Oregon and throughout the nation. In Oregon, Abigail Scott Duniway, arguably the leading spokesperson for the women's suffrage movement, blamed the prohibitionists for many of suffrage's defeats at the polls. By 1912, when women's suffrage was enacted into law by the people of Oregon, the two movements had essentially split. During the late 1800s the temperance movement continued to agitate the state government for prohibition and liquor control reform. In November of 1887 Oregon voters defeated a proposed amendment to the state constitution to institute state-wide prohibition. Saloons were by law allowed to operate in Oregon by a measure approved by the voters in November 1889. On June 6, 1904 Oregon voters approved the local option act. This law established that a successful county-wide vote for prohibition would make each precinct in the county subject to the ban on alcohol. In 1905 the Legislative Assembly enacted statutes that enabled the implementation of the local option law. That same year the city of Hood River enacted prohibition by local option election. Subsequent challenges to the local option law during the years 1905-1907 resulted in local option being upheld by the Oregon Supreme Court. During the following years, various counties and cities enacted prohibition via use of the local option. Supporters of prohibition envisioned a society with less crime, domestic abuse, neglect, and accidents.They predicted that, with the proper guidance, people whose lives had revolved around saloons and drinking would be transformed into better spouses, parents, and workers. Freed from the debilitating effects of alcohol, these people would rise to a higher moral plane and become more productive citizens. As a result, the nation would grow stronger. Industries and individuals standing to lose from prohibition mounted a spirited counteroffensive. They cited the economic hardship that would come to farmers of such crops as wheat, potatoes, and hops. Owners and employees of breweries, distilleries, saloons, and other related businesses also foresaw doom. 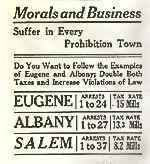 Some opponents predicted that a criminal element would fill the void left by the loss of legitimate businesses related to liquor (see "Morals and Business" mock ballot). 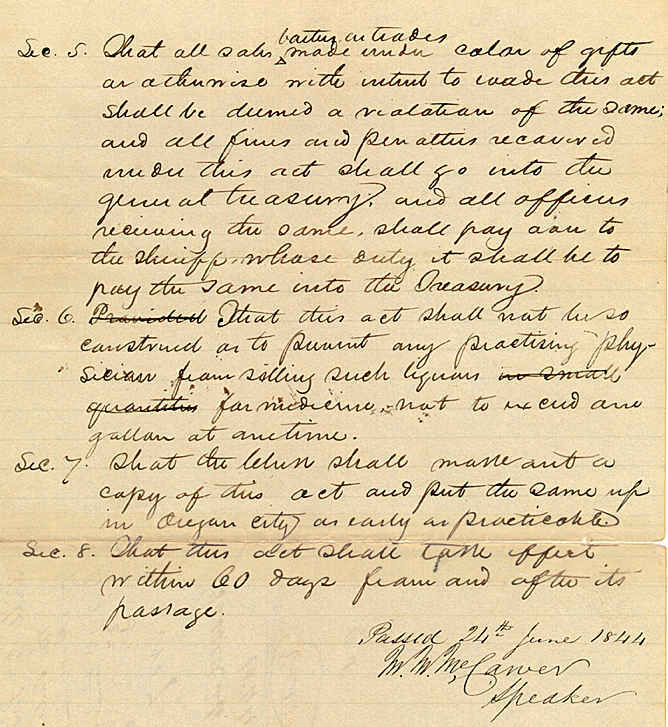 On November 3, 1914, five years prior to national prohibition, the voters of Oregon passed an amendment to the state constitution prohibiting the manufacture, sale or advertisement of intoxicating liquor (see related proclamation above left). In 1915 the Legislative Assembly, via the Anderson Act, enacted legislation implementing statewide prohibition. 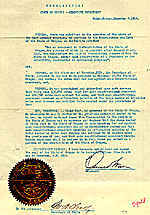 The law became effective on January 1, 1916. Less than a year later, in November of 1916, the state's voters defeated a proposed state constitutional amendment to permit the sale of beer. In 1917 the Oregon Supreme Court upheld prohibition in a challenge to the new law's constitutionality.